Enjoy huge energy savings and meet environmental targets, with the ideal complement to your refrigeration or air conditioning system. Our commercial solar PV solutions utilise the most advanced technologies, providing greater efficiency plus additional financial incentives. Book your free survey now, anywhere in the UK. Solar PV (photovoltaic) systems use semiconducting solar panels to convert energy from the sun into direct current electricity for your organisation. Power generated by solar PV systems is free, giving you a long-term, high-value return on investment. It’s cleaner and more sustainable than traditional energy sources. And with no moving parts, our solar PV solutions offer excellent reliability. Choose a commercial solar PV solution that maximises your financial return, from a provider with a 50-year track record of quality. Our range includes inverter and roof-fixed systems. Make sure your system meets Microgeneration Certification Scheme standards. As an MCS-registered installer, we supply, design, install and commission solar PV solutions the right way – so you can qualify for feed-in tariffs. Technology advancements mean our east, west and south-facing solar PV systems perform comparably. Your bespoke solution can utilise the very latest inverter and roof-fixed components. You could be paid for the energy you produce via a feed-in tariff. Your solution could also count towards your Annual Investment Allowance (AIA) scheme, allowing you to deduct its full value from your pre-tax profits. Your solution can be supported by a cost-effective servicing plan and 24-hour engineer call-out service. You’ll enjoy easier equipment compliance, minimal downtime and faster repairs. 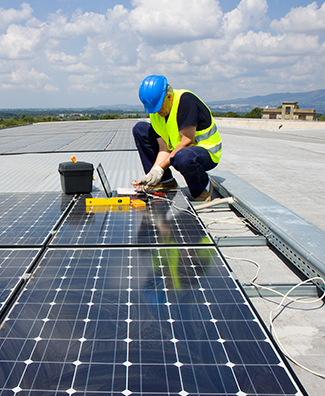 Learn more about our commercial solar PV solutions. And get a free site survey and estimate, anywhere in the UK. Call our Sheffield-based team on 0114 236 9971 or email us to get started.